The Mesquite Belt or MB, was formed in 1988 shortly before the UP-MKT merger. The newly formed railroad beat Union Pacific out of the Katy line from the Katy's North Yard in Fort Worth south through Tower 55 through Waco to Houston's Eureka Yard. Also included in the sale was the Katy's former Rock Island OKT line between Fort Worth and Wichita, Kansas. Trackage rights over the GHH (Galveston-Houston-Henderson) line to Galveston Island were obtained giving the Mesquite Belt access to the port of Galveston. 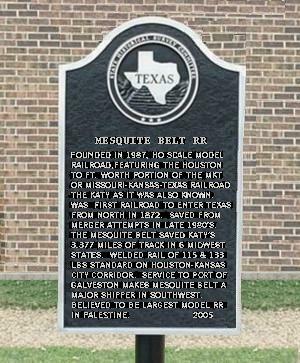 The Mesquite Belt also negotiated trackage rights over the Burlington Northern from the OKT line at Bowie to Wichita Falls, for an interchange with the Texas, Oklahoma & Kansas Railroad. In the early 1990's, the MB purchased the Atchison, Topeka and Santa Fe's Dublin sub between Ft. Worth to San Angelo. The resulting regional system connects the grain country of Oklahoma and Kansas with the mills and ports of Texas and serves a broad range of industrial customers throughout a dynamic and growing portion of the Southwest. The MB also formed a quick alliance with the Texas, Oklahoma & Kansas and the Teague, Mexia, Rock Island and Gulf. This coalition had the capability to compete with other Class 1's, with their overall traffic capabilities within the state of Texas, and points beyond. Improvements were made to the existing route by connecting passing sidings, thereby creating a double track mainline. These improvements, along with CTC signaling produced a traffic pattern maximizing the route's potential for revenue. The Mesquite Belt feels that we should use our model railroad interests to benefit the community. This is done by offering entertaining and educational events at our large model railroad layout (850 sqft) to such worthy groups as the 4H, Boy Scouts of America and school groups. The Mesquite Belt is a proud supporter of the Ronald McDonald House in Dallas, Texas, thru "The Trains at NorthPark." This large layout is on display during the Christmas season at NorthPark Mall in North Dallas. From the private collection of Mr. & Mrs. Ban K. Bywaters, the Trains at NorthPark feature more than 35 O-Gauge locomotive traversing their way across a miniature America. The magical journey winds its way from the Golden Gate Bridge to Mount Rushmore and past the Dallas skyline before taking in Washington, D.C. and New York City's Times Square. The Mesquite Belt provides guest tickets to The Trains at NorthPark. Since 1987, "The Trains" have been seen by over one million people and approximately one half of the annual operating budget of the Ronald McDonald House of Dallas comes from the proceeds raised by The Trains at NorthPark, and it's sponsors! The Mesquite Belt can handle group outings and hosting other model railroad clubs for guest operating sessions, as well as active involvement with the Piney Woods Model RR Club and NMRA.